Guess what’s the utopia for cyber crooks? Social networking sites; to be more specific, Facebook. Incidences of Facebook accounts being hacked is not anymore an uncommon scenario. According to a report by The New York Times, nearly 600,000 attempts are made every day to hack into FB user accounts. This one’s a no-brainer. You want to secure your property, you need a strong fence. One smart way to set a strong password, is to think of a phrase and modify it by adding numbers, special characters, or so. For example, a password such as HowMayIHelpU2day@789 is easy to remember and at the same time, difficult to crack. [Check how strong is your password here] Also, keep different passwords for different accounts. 3. Play Hide but Not Seek! 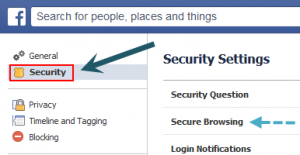 You can keep yourself from being searched on Facebook directory and search engines as well. Click option 3 and uncheck the box if already checked. This is another security feature that notifies you whenever your account is accessed from a device you have not used before. You may choose to be notified via email or text message or both. Go to Accounts Settings, select Security, and then click Login Notifications. This feature lets you view the location you are logged in from, device you used to login, and even the device type. If your account is logged in from somewhere else, even that would be shown here, with an “End Activity” option. If the other location seems unfamiliar to you, then click this option. 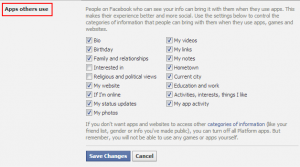 The information that you share with your FB friends, can be used by apps your friends use. To avoid this, you can choose what information to share and what not to share. Then select “Apps others use“. As you can see in the screenshot below, most of your info would be checked by default. So, accordingly choose what you want to share and what not. Whenever you are accessing your account from public place like cyber cafes, ensure that the option “Keep me logged in” is unchecked. Another no-brainer – no matter which site you are in, always log out. And that would be all from us on how you can tweak your FB account privacy settings, and reduce the odds of getting hacked by crooks, even if they try it for 600,000 times! With the help of this blog now we can more secure. You can easily share this post with your friends on Facebook and Twitter. i have always a problem with my facebook acc. and he allways hack my facebook acc. but not now his hack toll is not possible to generate my facebook acc. password. This is very useful Information for me. 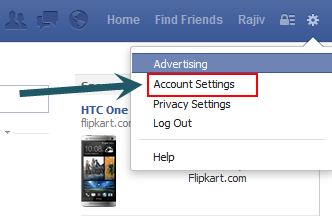 I want know, how I can use filter option for images, means nobody can post the dirty images on my wall. Is it this function already on facebook or social networking sites? Click “Who can post on your timeline?” You will get two options – “Only Me” and “Friends”. Select accordingly. Does Facebook have something like 2 factor authorization if yes how do I enable it? Very good advice and tricks. Kindly follow this link; it will take you to Facebook’s forum, where you can get your query resolved. a very helpful and important blog . thank a ton for it. thanks alot rajib .. 🙂 . fb is now more secure i think . If not wishing to be found or recognizable, isn’t it also a good idea, not to post a clear photo of yourself for the profile pic? My understanding is, no matter how tight your privacy options are set, the profile pic is open for all to view. Please correct me if I’m wrong someone? Another tip I find useful is groups: Sometimes there is information or posts you only wish to share with certain people. 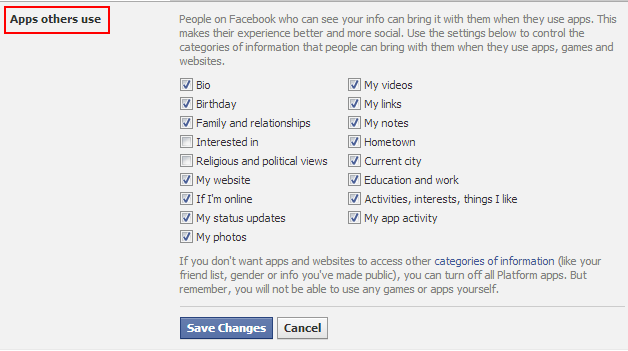 If you allocate a status to people you’ve added (i.e. friends, close friends, family etc), you can then control every post by clicking on the “friends” option on the right hand side of where you’re typing your message, then select who will see your post. Thank you for sharing your advice with us. Thank you rajib sir for this blog. It will be very helpful to secure my account from hackers.I share this blog with my friends also. You can make use of Quick Heal Total Security 2013 to provide all-round protection to your computer. To know about its different security features, please follow this link. 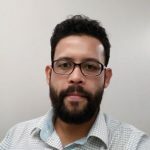 Thanks Mr. Rajib for all informations. Can you please specify further what active session you are referring to? Most active sessions where online payments are involved usually expire within 20 minutes or less. Do share some more details with us so that we can help you better. Please contact the Facebook Help Center for assistance with this.